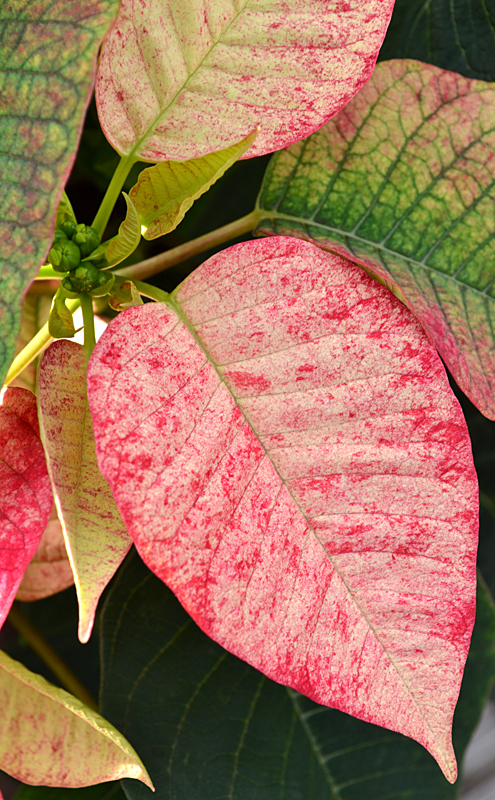 The traditional poinsettia is beautiful with its red and green coloring, but there are many varieties that you might like even more. You can see many new and nontraditional varieties of poinsettias at Mischler’sFlorist and Greenhouses, 118 South Forest Rd., Williamsville. Mischler’s grows their poinsettias right in their greenhouses in Williamsville. A new one is Picasso, which Yadon describes as “naturally airbrushed,” with shades of cream on red. One of my favorites is White Glitter, which is red with white flecks. Those flecks remind me of confetti and make the plant seem so festive. 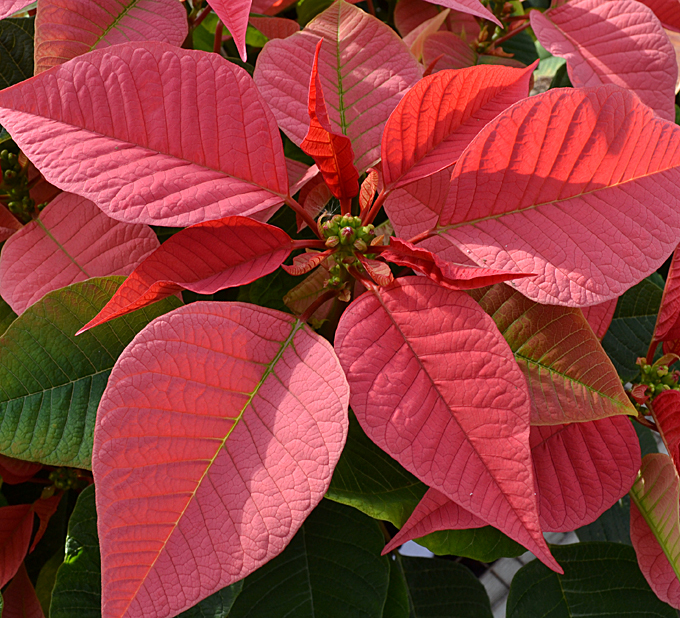 Please note that while you can find poinsettias that have had glitter glued on or poinsettias that have been painted, all of the poinsettias that we’re talking about in the article are grown with whatever colors they exhibit. “They’re great the way they are,” Yadon said. On ‘White Glitter,’ the coloration will be different on each individual plant. Some plants can have half the “flowers” red with speckles while the other half of the “flowers” are white. On ‘White Glitter’, notice the deeply cut bracts and leaves- they have the shape of holly leaves. 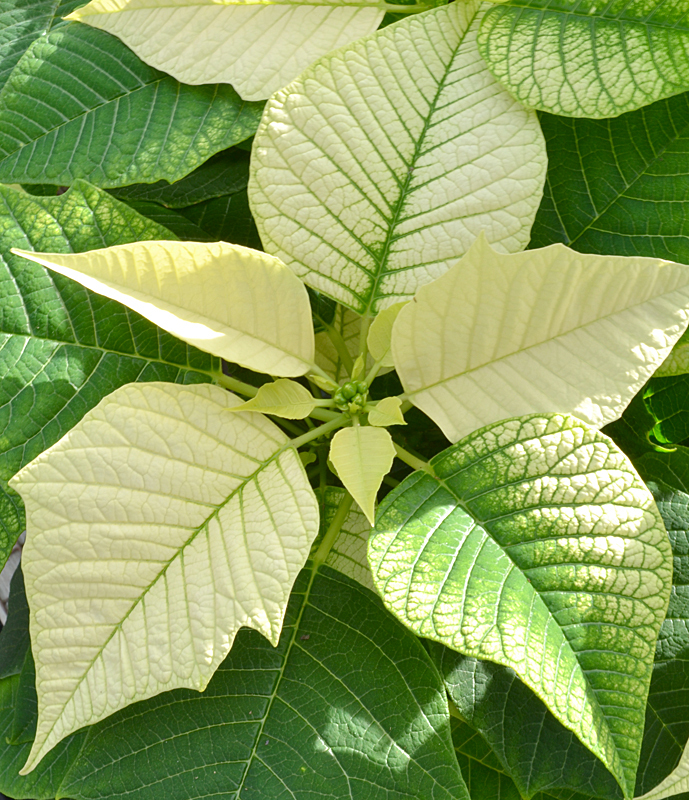 One of Yadon’s favorites is the white ‘Polar Bear’ poinsettia, which has beautiful green veining. This plant also helps conservation efforts. When Mischler’s purchased the cuttings to grow the ‘Polar Bear’ poinsettias, a donation was made to Polar Bears International, a nonprofit organization dedicated to saving polar bears by saving their sea ice home. When you buy the plant, you can also get a gift tag explaining this “Conservation in full bloom!” idea. 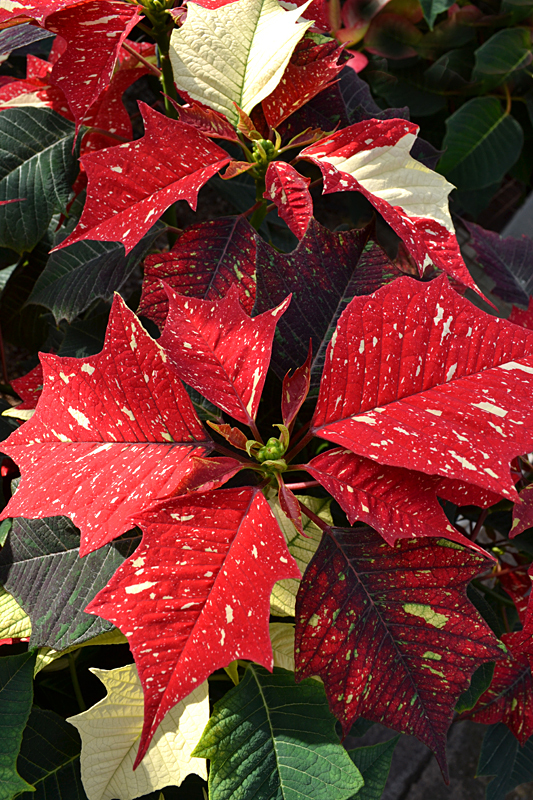 If you want to stick with a more traditional red poinsettia, you might like ‘Ice Crystal’, which is cream with red edges. 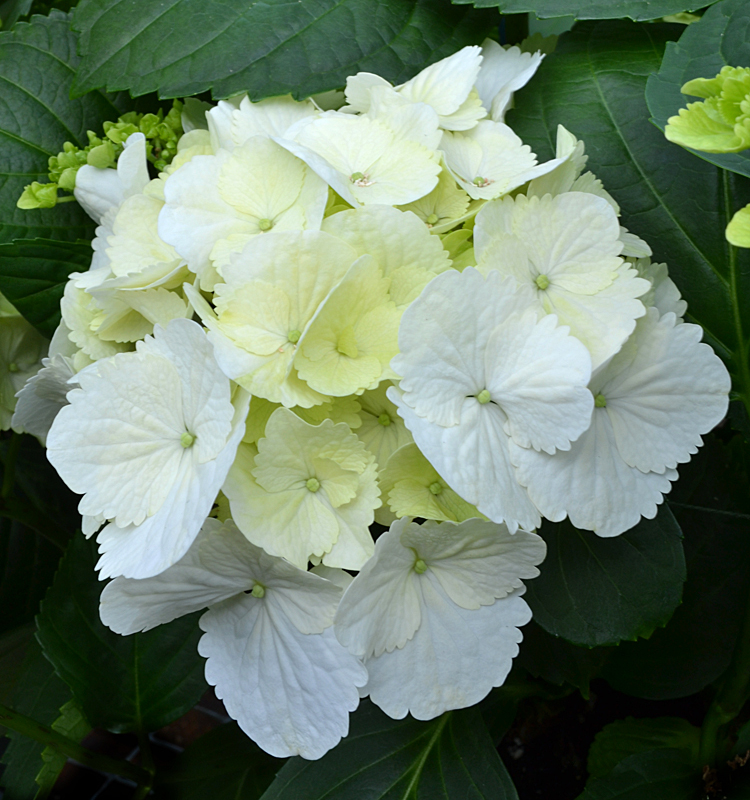 If you want something even less traditional, how about a ‘Snowball’ hydrangea? You usually see something like this at Easter, but it should make a nice alternative to poinsettias, Yadon said. This is the first time he is trying them at Christmastime. A ‘Snowball’ hydrangea is a nice wintertime gift for anyone, including those who don’t celebrate Christmas, Yadon noted. It can be wrapped in blue for Hanukkah. The ‘Snowball’ hydrangea will last for a long time in the house–probably a couple months, he said. Keep it in bright sunlight and keep it well watered– it takes a lot of water. You can try to move it outside to your garden in the spring, but it’s not hardy for our area and probably won’t last through the next winter, he said. Mischler’s can deliver holiday flowers, including poinsettias. Mischler’s has also set up a display of poinsettias that you can use as a backdrop for your Christmas card photo or holiday photo for Facebook. The photo shoots will be held from 10 a.m. to 4 p.m. Friday, Nov. 23; Saturday, Nov. 24, and Saturday, Dec. 1, 2012. Click here for 2013 dates and times. Mischler’s associates will be happy to rearrange the furniture and backdrop so that you can take your special photo. Last year, one family wanted to take a picture of their little boy. The staff took away the bench you see in the first photo and set aside some of the poinsettias. 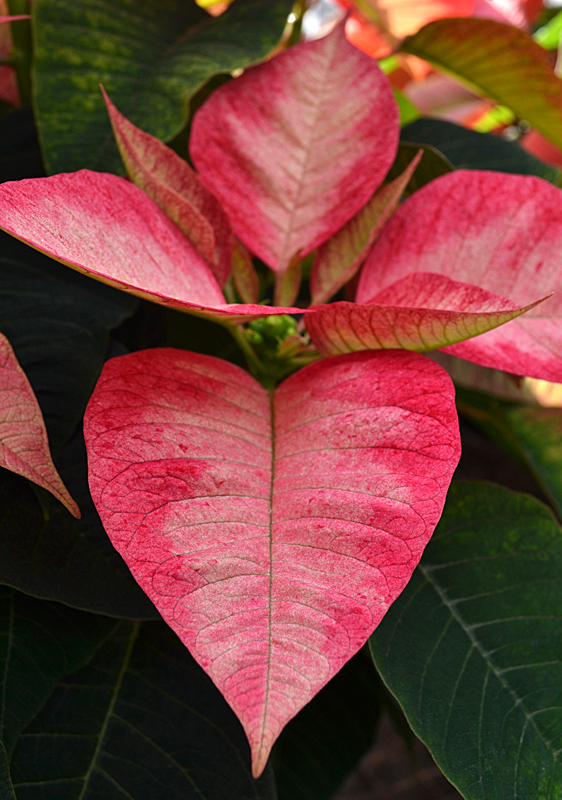 The little boy stood on the platform, completely surrounded by the poinsettias. 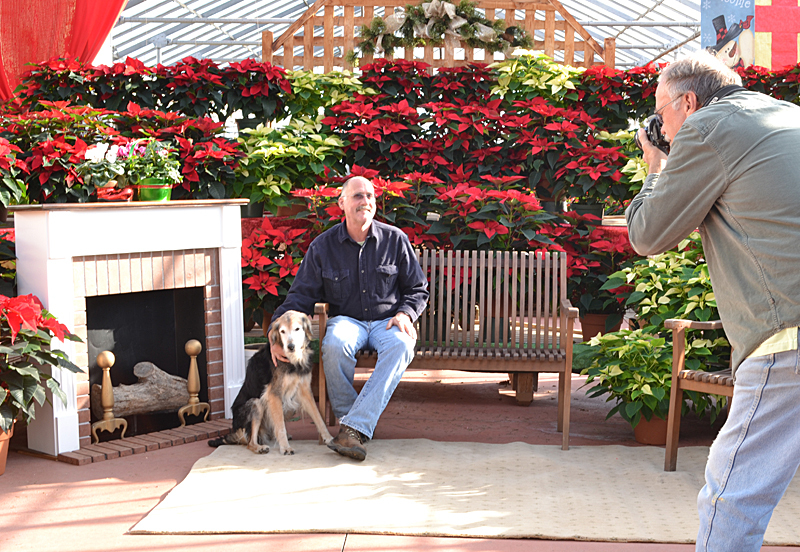 That’s Yadon posing with his dog Shadow while Dan Meyer, greenhouse associate, takes the shot. Yes, pets are welcome for the family photo shoots– they’re part of the family, aren’t they? Make sure you bring your own camera. The event is part of the Holiday in the Village of Williamsville celebration presented by the Williamsville Business Association. “It was a really nice photo,” said Mark Yadon, vice president at Mischler’s. Photos by Connie Oswald Stofko. Beautiful. 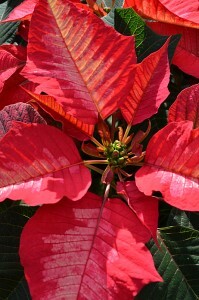 I love poinsettias and the hydrangea is lovely and so unexpected. Thank you, Connie. The hydrangea is new, yet it really would fit in beautifully to a winter decorating scheme. It’s surprising we haven’t been using before. Thanks for writing. I did not know they did this service. It really is nice for people to get a beautiful image of their family, even the family pet I see. Yeah, it’s fun. I saw one photo of a woman and her dog that she took at Mischler’s and posted on Facebook. It makes a festive background. I like the hydrangea idea – it’s beautiful! Yes, even though it’s not a traditional holiday plant, I think it would fit in with any decor, including traditional.Thanks for writing.